Hello from Australia! You’ll pretty much always find me dreaming about my next favourite shawl – the accessory I most love to design, knit and wear. Otherwise I’ll be wandering about my vegetable garden, nearby bush or perhaps a little escape to the beach. With a background in painting, I have a passion for colour and interesting design. Making is my happy place and has been since I was a girl surrounded by the chaos of my mothers textile art and design. She had a basket of fabric that was taller and longer than me – I could literally dive in! In knitting I have found a craft that resonates deeply within me. 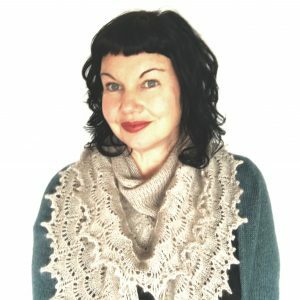 My knitting designs come from both a practical need – wanting to create items for myself and others to wear and also a compulsion to express myself creatively. I am influenced by everything around me; fashion, nature, beautiful yarn, favorite artworks. I design contemporary knitwear patterns, with a nod to retro and geometric design. Patterns that are straight forward to make and fun to wear. I also love to make jewelry, this love has been focused on knitters jewelry, initially I created these for give-aways – prizes for those who enjoy knitting my designs, due to many requests to purchase these items I am excited to now have my own range of shawl pins, stitch markers and enamel pins available via my etsy store here. Join me in January 2019 at Vogue Knitting Live in New York, I’m delighted to be teaching a variety of classes. Find all the details here. I live in a regional town in Australia, with a vibrant artistic community, with my architect partner and our beautiful son.